Cutting out the fabric took me a long time. Because some of the fabric is small scenes, I couldn't cut it as fast as I could a straight pattern. I had to measure and test how many squares I could get with legit scenes that would look complete on the quilt. After laying out the quilt pieces on the floor, I found a pattern that I liked - with no two of the same squares touching. Denise Schmidt, an amazing quilter who has written several books, recommends labeling each quilt block with a designated letter and number so you won't lose the pattern you've created. So, I called the first row A and the number of square I was on. So Row 1, square 1 was A1, row 1 square 2 is A2. The first square in the second row is B1 and so on. It helps so much. After sewing all the squares together, I finally have the completed quilted top. Now it's on to the hard part- the backing. 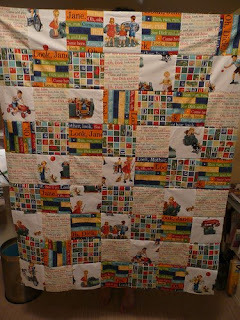 This is the most gorgeous quilt ever!!!!! I can't wait to wrap Baby up in it....and to tell her that her Auntie Sassafrass made it for her! :) Luv you!!!! !